Cream Satin Drape, 18 x 24, oil on linenI am trying a technique that is different from my other paintings. I usually work in the Indirect Flemish Method: Many thin layers on wood panel to get a very high level of realism, without texture, for an almost enamel-like finish. 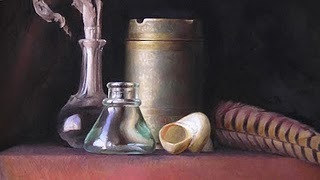 It can take 4-6 weeks to complete a very small 9x12 inch painting. DETAILIn contrast, this painting is done with a Direct Method: Only 2 layers (the umber underpainting and one pass of full color), painted with thick, loose paint, on stretched linen support. At 18x24 inches it is larger than most my work, and it took less than 2 weeks to complete. I am finding what I have long suspected to be true: Working precisely and with great control in my more detailed work is teaching me to see better and make better decisions when I work faster and more loosely. The strokes are applied slowly: I look at my subject, decide what is the ONE stroke I want to make. I load up my brush with the correct color, and then very, very slowly make ONE mark. Then I look at it, and decide if it is right or wrong. Sometimes I need to wipe it off and try again if it is wrong. Then I decide what my next stroke will be. I start slow, but during the session I naturally speed up, keeping this same level of attention on every stroke. I stop thinking and it starts to feel like the brush is painting on its own. 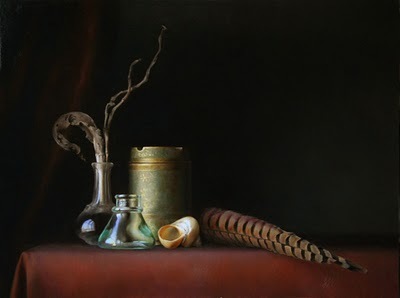 I use a very light touch, only touching the paint to the canvas, not the bristles. In addition to swiping the brush, I also might push, twist, or wiggle the brush to make the stroke needed. The light touch lays the paint on the canvas, and might leave some broken scumbling drags, without pushing the paint flat. When loading the brush: To get thicker paint, I push the brush forward into the paint puddle on the palette, not a just a back swipe. I build up a nice glob of paint, with even maybe with a string of peaked paint at the tip. Every stroke should make the painting feel like it is developing and getting better. If it starts to feel like I am “fixing”, and the painting feels like a struggle, and the painting gets worse even though I am trying to make it better…. I stop painting. I wipe or scrape anything unsuccessful, I breathe, slow down, take a break, and try again. 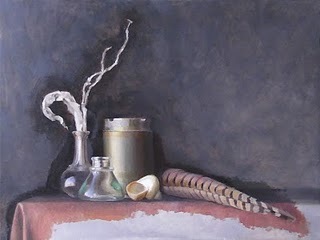 While painting this I was thinking about how I would teach it as a class or workshop, and realized the only way I could teach it is to teach the Indirect, Flemish method I already teach. For every Direct stroke one must think about drawing, value, color, and edges, all at once. The way I would teach this is to practice each of these skills in isolation until each is mastered, before trying them all at once. The Flemish Indirect method separates these steps and is an excellent way to learn all of this. For me, working in this more Direct manner is emerging naturally from my Indirect method of study. 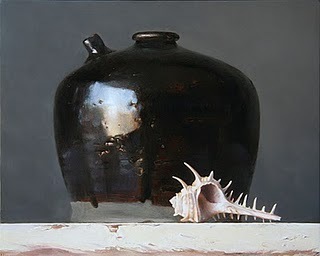 What at first glance could be a simple arrangement of a seashell and a floral spray, reveals upon a closer look to be damaged objects, tattered and chipped. However, the inherent structural beauty required to sustain life resonates with the sense of life departed, yet celebrated. The Vanitas theme exhorts us to focus on the brevity of earthly life, and we delight in the details of the insignificant and ephemeral. The attention given to these torn and damaged objects is an exploration of our own humanity: Insignificant, brief, and yet somehow important. The plant fragments are Luneria, known for their seed pods which remind us of the moon, or silver dollar coins. They are are the seed pods of a eucalyptus plant, stripped of their brown husks to reveal the silver transparent petals which protect the seeds. 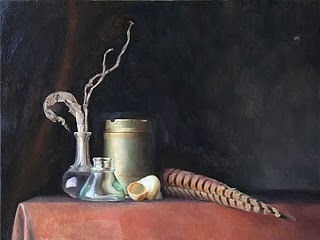 The show has become a focal point for painters and collectors of still life, and I am thrilled to be participating again. Ever since I got a lesson from Michael Klein in direct-method flower painting a couple months ago I’ve wanted to try it again, and once I got home from France I finally had a chance. The landscape painting also was a good warm-up for direct method painting in the studio. I usually paint Indirect, or Flemish method - where I work in many layers, allowing each layer to dry completely before applying more paint. With Direct method, wet paint is layered over wet paint, and most of the strokes of paint you make will be visible in the final piece. The goal is to get the correct hue, value, chroma, and edge down in each stroke, without adjusting. For these paintings I am using New Traditions L600 lead-primed linen which comes in big rolls you can cut to the size you need. 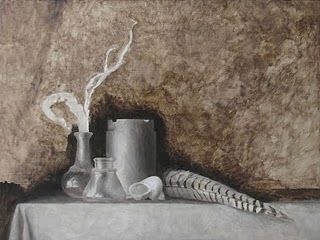 I started each painting with an underpainting just using Burnt Umber to work out the composition, basic values, and placement of the objects. I used Rosemary brushes which I like a lot, they are totally different than the more controlled Robert Simmons white sable brushes I use for Indirect painting. All of these paintings were done alla prima, meaning in a single day’s painting session. Direct painting can be done in one session or over many days or weeks, but each stroke is painted as it is meant to be seen in the final painting. And now I’m back to my regular Indirect method, as I have been working the last few days on a preparatory drawing for a new piece which will take me about a month to complete. I won’t have much time to paint in the next few weeks, between teaching my workshop, various short travels, and attending Weekend with the Masters, but it’s been fun to start at least. This year I turned 40, and to celebrate I planned a month of landscape painting in France, something I have wanted to do since I first visited France at age 16. I chose the Dordogne region in the south-west of France because of it’s reputation for beautiful, varied landscape: rolling green hills, cliff towns, winding rivers, forests, and most important…… castles!! We rented a house in the gorgeous little town of Beynac-et-Cazenac, which is a network of steep cobblestoned streets and adorable stone houses crowned with a 12th century castle at the top. I decided to paint on paper for a portable, lightweight material perfect for plein air sketches. Before the trip I cut sheets of Rives BFK printing paper in various tones into standard sizes, mostly 5x7 and 9x12. Then I primed the paper with 2 coats of Golden Acrylic Medium. Each day I just taped a piece of paper to a foamcore backing and mounted it on my Open Box M setup. It was a wonderful surface to paint on! As it turned out, it ended up raining for 2 of the 4 weeks we were in Beynac, so I did not get to paint nearly as much as I’d planned. But instead we hung out with visiting friends and family who shared our rental house and rented other houses in the same village. Chateau Castelnaud, 9x12, oil on paperAt the very end of the trip the rain cleared and I got one last painting day in. I found a beautiful quiet spot next to a field of corn with a view of neighboring Chateau Castelnaud. The day was warm and lazy, and the #1 BEST thing about painting in France is….. NO MOSQUITOS!!!! Mylar is a new material I tried out as as support for an oil sketch (I use a brand called Dura-lar). 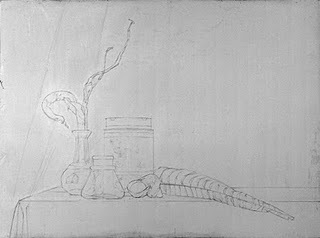 Mylar is a frosted drafting film and I’d read online that it is an excellent material for oil sketches. The surface is smooth but toothy, and grips the paint well. The film is archival (it’s essentially plastic), and creates a stable bond with oil paint. I started with a drawing on paper, which took the first 4 of 8 sessions with the model. The block-in is below, you can see the full drawing in an earlier post here. 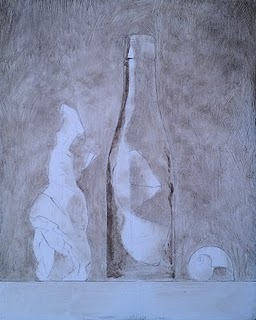 14 x 17 inches, graphite pencil on paperWhen I was ready to begin my oil sketch, instead of tracing the contours and transferring the drawing to a painting panel, I simply laid the mylar directly over the drawing and painted on the translucent film, with the drawing visible but protected underneath. the painting was done at night under artificial light. I don’t enjoy painting in color under artificial light, so I planned this as a monochrome sketch. I used Ultramarine Blue, Burnt Umber, and Zinc white to mix puddles of value. I mixed two “strings” (rows of paint puddles) on my palette each session, one string of cool grays and one string of warm grays. This way I could control the temperature of the values, even though I was not using color. I really enjoyed working on the Mylar surface, it allowed for a lot of control of the paint and offered a surprisingly agreeable drag - not as slick as you might expect. It was perfect material for a sketch, but I would not do a finished painting on it. Next time I would use drying agent in my medium, as unlike a chalk-gesso panel it’s completely non-absorbent so it took nearly a full week for each paint layer to dry. The composition for this painting has been slowly evolving in my mind for months, ever since I found the polished abalone shell at a flea market in Seattle while visiting friends there last Labor Day weekend. Abalone shells are lined with pearlescent nacre, and I have long admired the turquoise, veined interiors and wanted to paint one. But the outside of the shell is usually an ugly, gnarled granite, and I wondered how I could prop one up on end to expose the more interesting inside. When I found this one, buried in a pile of old clocks and dolls at a flea market, but with the outer shell sand blasted off, I knew I had to have it! Since then, the shell has been sitting in a shadowy corner of my still life shelf. 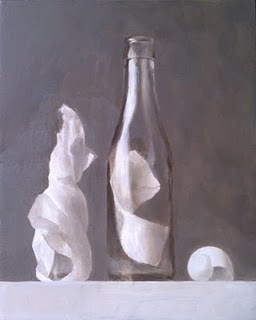 As I worked on other paintings over the last several months I watched how the shell seemed to melt into the shadows, leaving the ethereal, pearlescent surface just barely gleaming out of the depths. Abalone shells are a low, flat spiral shape, and both the colors and the shape seemed to call for spirals of waves submerging it, implying the shadowy depths beneath tidal waves. I arranged the shell low in the composition, and twisted sheets of wax paper in winding spirals above it. 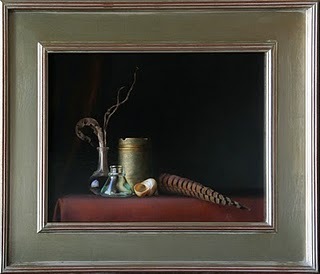 The distressed, painted shelf supporting the still life has become a cherished fixture of my studio, and by now I have painted every chip and knotty whorl along its edge many times. Somehow, the shell just landed at an opportune spot, and the largest knot on the wood seems to act like a faint, inverse echo of the shape of the shell and waves above. As much as I carefully compose my paintings, I like to embrace these happy accidents, which usually only reveal themselves to me deep into the process of painting. This painting, including the preparatory drawing, took about 5 studio days a week for about a month. Aside from teaching 2 days per week, this was the sole project I was working on for the course of the month. As with all my paintings, I work exclusively from life, never from photos. I use the finest materials: handmade gesso-primed panels, time-tested medium recipes, and quality oil paints, built up in thin layers. 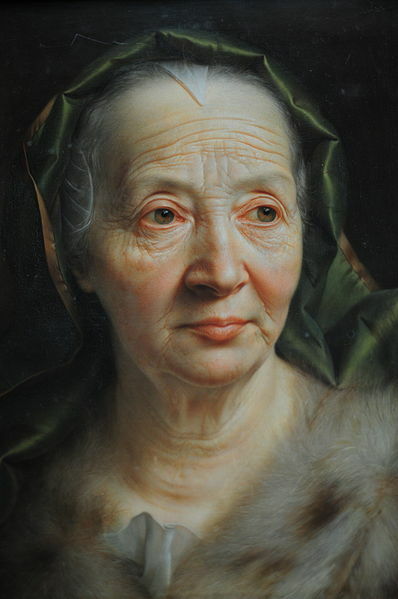 My process is inspired by the historical Flemish layering technique, which I feel is the only way to achieve the level of realism and illusion I aim for. I teach these traditional drawing and painting techniques in classes and workshops at my San Francisco studio. I have been working on this self portrait for the last couple of months. It was an interesting challenge to take the same process I use for still-life and apply it to a self portrait. The painting is an homage to an 18th century German-born painter I recently discovered named Christian Seybold (1697-1768). I find his painting of a woman in a green veil particularly stunning. I was thrilled to see how he created extremely fine realist surface detail, supported by a structural understanding of the underlying form, and I tried to emulate this. I also took inspiration from the scale and cropping of the portrait, the fur collar, and the paintbrush tucked behind one ear. Below are the in-process shots of the stages of the drawing, the under painting, and the final painting. This is the final stage of the painting I have been documenting step-by step. A tiny bottle wrapped in cream-colored tissue, a larger bottle carrying a message but with no cork to protect it, and finally a fragile shell, so thin a breeze could lift it... water, air, travel, mystery, and adventure are all woven into this simple design of three objects lined up on a shelf. They seem to tell a story together, of secrets and memories, but we are not sure what it is. These objects seemed to arrange themselves on my shelf, and demand their story be told. 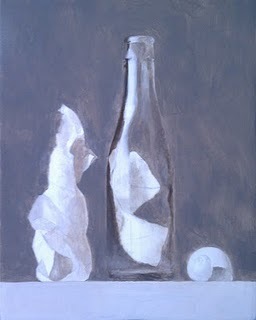 But what I did not realize when I set out to paint this, was what a challenge the glass bottle would turn out to be! What our mind tells us is a solid glass vessel with weight and symmetry, is actually only an arrangement of reflections superimposed on the background. One small mis-step of the brush or the eye, and the reflection wavers and the integrity of the bottle is lost. Making this ephemeral illusion stand straight and symmetrical was a challenge, it only wanted to lean and warp! But I finally managed to nudge it into a position of solid grandeur, bravely holding its fragment of a note. You'll have to compare this very closely to the previous version to see the changes, but this step represents several more hours of work. From here on out, the steps between stages will be incremental, hardly even noticeable in the photos posted here. But I'll try to post close-ups and describe what I am doing as much as possible. Even though I have begun color at this stage, I am still thinking of it as under-painting. In fact, the more I develop as a painter, the more I find that most of my time spent on a painting is "underpainting" - preparing the bed of values and hues the final painting will lay over. So here I am mixing my values with colored pigment instead of just grey. I'm also just starting to warm up the colors of the shell, message paper and tissue. Finally, I am adding a new level of refinement and detail as I make my first pass of color. 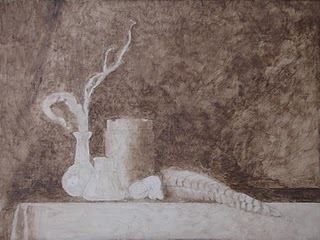 You might not be able to see much "color" in this stage of the painting versus the previous monochromatic underpainting stage. But now I am mixing my neutrals values with a palette of color, instead of just grays. The main difference between painting with monochromatic values and painting is color is in the transitions between light and shadow. In monochrome, you can just mix a bit of the 'light" puddle with a bit of the "shadow" puddle to make the halftone between. When painting in color, the "halftones" is where all the most saturated color is. 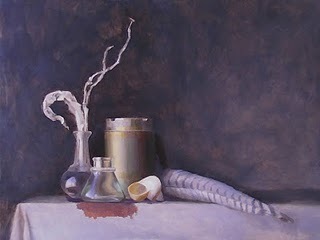 So each step between the light and shadow must be analyzed and mixed to match a hue/color, in addition to the value. 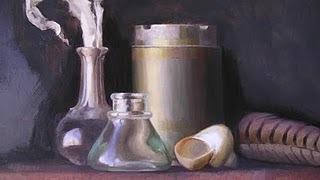 This is very subtle when painting a monochromatic subject in color, because all the hues are relatively desaturated. But it's what makes even a monochromatic subject look like it is "in color". 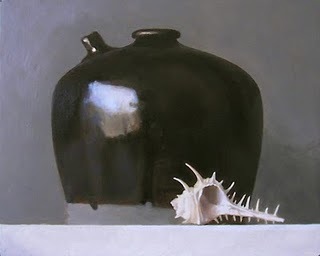 Also, even in sharp edges, like where the edges of the white seashell touch the black background of the pot, the paint will look chalky and clunky. The tiny seam where the white meets the black must be knit together with a deeply saturated, dark orange or red. 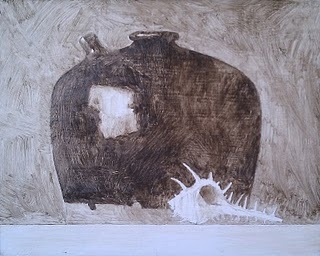 Otherwise the white seashell will look like a cookie-cutter shape pasted over the background, instead of a believable object sharing the same reality as the jug. To do this, I use a small brush to push rich, saturated mixtures into the edges of the shell, and then back-fill the seashell with white, leaving a tiny thread of color between the light edge and the black background. Since this technique is subtle and microscopic, it's impossible to see the effect in this photo. But careful attention to the reality of the edges will make the painting look believable in person.